We recently had the entertainment room in our home renovated which obviously required me to completely dismantle my multi-component AV system and stand-alone Yamaha/Denon stereo system. I could not locate my 797 User Manual so I checked out a few Websites and eventually downloaded a replacement from Crutchfield's Website. While searching for the manual, I read several 797 reviews on various Websites and found that many people feel the same as I do about the build quality and performance of the 797. Most people rated the receiver 4 to 5 stars and the narratives pretty much reflected the same thing--that the receiver is truly an awesome piece of work. I purchased my 797 in 2009 as an upgrade to my 1984 model Yamaha A-1000 Integrated Amplifer and it has never failed me once. It is actually my pride and joy in terms of listening to my favorite music which is traditional/comtemporary gospel, traditional/comtemporary jazz, and classical. I appreciate the stereo 797 more than my Yamaha AV receiver because I realize that 'most' AV systems are not designed primarily for music reproduction. Saying this, my multi-thousand dollar Yamaha /Panasonic/LG/Klipsch AV system is no comparison as far as music is concerned--the system sounds great but not outstanding like my 797 system. I'm an old school guy and really appreciate the simplicity of stereo systems--stereo sound has always impressed me as both simple and down-right natural. This to say that the 797 is a real work horse and compliments my speaker system perfectly--not the other way around. Its power is somewhat over-kill for the vintage and (highly efficient) Bose 901 Series V speakers I've owned since 1984 as well. I purchased the 901s (and Active Equalizer), a Yamaha A-1000/ T-1000 Tuner, Yamaha GE-60 Graphic Equalizer and Teac Reel-to-Reel all in 1984. Every Yamaha component still works perfectly, too. I sold the reel-to-reel years ago--but I'm talking over 30 years of faithful and reliable service from this Yamaha equipment folks!! As a matter of fact, I still use the GE-60 EQ with my 797 and Bose EQ. Trust me--it does the job that I need it do without fail. This is because I've learned how to use it over the years. So it works great for me. Lastly, it should quite clear to all that I am a true believer in Yamaha audio equipment. This being said, I wouldn't part ways with my RX-797 receiver under any circumstance except under the Lord's holy command. It is that good!!!! Boy oh Boy... I'm currently 16 and my dad got this receiver to power a pair of Polk Audio lsi15(s) when I was 12 and man do these things sound amazing. Here in Dubai where temperatures and dust is a huge problem, no matter how long I keep this thing on, It still powers the Un-bi amped Lsi15(s) (Yah go ahead and laugh your lungs out but Bi-amplifying these towers inside a small apartment can be ridiculously loud at times, however though Dad told me that plans are on the way for stepping up the game after exams so yeah). Now to Audio Quality and fidelity, I've always wanted to try Hotel California on these towers and one fine day (a couple weeks ago) and boy did I scare the Heck out of my mom when she saw the ceiling of her kitchen Nicely bouncing up and down to the Kick Drum Of the Track. (The File was a FLAC file which is totally uncompressed so all the frequencies pass right through the output of the Playback device straight through the Amp) The 797 has no problem of coping up to the task of powering these 4-ohm monsters. The Audio clarity of the 797 is astonishingly pristine and clear. From Playing Deep Edm tunes to delivering the punch of the kick drum without compression to listening to calm jazz saxophone instrumentals and to hear the ride cymbal so clearly while listening to concerts, this receiver takes it all.Now I know that this unit is not available brand new but I've heard that the replacing new models are pretty good too so I personally recommend the buyer who is out there wanting a unit that delivers plenty of power when needed while not compensating on much-needed clarity and tone and not intending to spend a whole fortune for buying this unit. Anyways here is my take for an honest 9-year review. Bought this receiver used to replacing a Harman Kardon AVR10 which was used to power the tweeter-midrange section of Aerial 10T speakers. The Aerial's bass section was driven by another pre-amp / power amp. This was a temporary setup as I sold the Adcom 5800 power, which was more than adequate to drive these speakers but I know these speakers have much better sonic performance with better power amps as I have heard them with a single BAT VK-60. It was obvious the HK AVR10 did not have sufficient power to drive the upper end unit but sonically at moderate volume it was adequate in the biamp setup. I did the requisite reading of Internet reviews of the RX-797 and finally decided to risk buying it as it had mostly good to very good reviews. It does have a very good FM reception; the CD Direct operation does reduce noise as I was able to listen to the noise level from the tweeter with no music playing and switching the CD Direct on-off, with it on the noise level drops. I wanted to check operation of the receiver so it was the only device to power the Aerials and for my listening environment it is more than adequate for much higher levels of SPL. So still trying it with different music from CDs and FM stations. Compared to the Adcom 5800, its sound has greater clarity in the upper frequencies, lower frequencies are more apparent, could be due to its lower damping compared to Adcom 5800 which has much lower output impedance. It would have been interesting to use the Adcom in a biamp setup, powering the bass section and this receiver the tweeter-mid section. After listening for several hrs each day it is not sonically irritating as the Adcom was. Amazing amp, have it hooked up to a pair of totem dreamcatchers and the sound is absolutely incredible, I have a nice pair of sennheiser 595's with a little dot mkIII tube amp and I thought that was good, but this is a whole different ballpark. Also the loudness control amazes me still to this day, I have a sound in mind and tweaking that control brings it to exactly where I want it, whoever made that obviously knew what they were doing. Only complaint I can think of is that the remote could be better, my buddy picked up a comparable yamaha receiver and the remote is much nicer, that and a way to control the loudness control from the remote would be about the only thing I could ask for, except a nice dac maybe. I have my 797 bi-amped with a Onkyo M282 to four Polk RtiA3's. Two of the Polk's are bookshelf speakers in a concrete basement, and the other two are floor standing speakers upstairs in the main living part of my house. The sound is nothing short of phenominal. Evey aspect of the sound is precise. Perfect highs, and the bass is killer. The Polk A3's are the perfect match for the RX797. You have to be positive that the zone 2 for the bi-amp is set correctly, and you'll have what I think is the perfect system for the money. And, you can crank thebejeebers out of the volume for a crisp, clear sound. Couldn't be happier. This system replaced what I was convinced couldn't be replaced. Yamaha, Onkyo, and Polk make wonderful products. I bought this amp after auditioning several sub-$500 models, including lower priced Yamaha models, Harmon Kardon and possibly one other brand. I chose the RX 797 because, in the showroom, it sounded far cleaner and richer than the other models. However, after 2 years of use I can't say I'm satisfied with my system's sound. Though clearly cleaner, smoother and richer than the other amps I tried that day, it nonetheless has a cold, sterile sound overall that I've never taken great joy in, and which I can't listen to for all that long before I become I get worn out. The overall sound is simply thin, with the exception of a few extremely well engineered albums that do come through as rich sounding. I have to add one big caveat, however. I run this amp through a 20+ year old pair of Yamaha speakers (NS200MA) that are very, very cold. I have often wondered what would happen if I ran the Yamaha amp through a modern pair of speakers that had a warm sound. Possibly then I'd be satisfied with the sound. I can say that the Yamaha is a wonderfully built piece of equipment - soild, good feel to controls and an excellent FM tuner. In fact, I often prefer listening to music via the tuner since it sounds generally warmer. My music is Apple Lossless and MP3 files streamed through a Squeezebox Classic hooked up to a Cambridge Audio DAC Magic external DAC. The external DAC was a huge improvement over the internal DAC in the squeezebox, but hasn't been enough to overcome the coldness in the amp and/or speakers. My next move, when I get money together, will be to replace the speakers. It would be great if that's all I need and I can continue to use the Yamaha amp. In spite of all I've said against the AMP, for some reason I do like it (maybe its simple honesty of design and intergrated FM tuner), and hope better speakers will do the trick. Sound quality, looks, build quality, functions and abilities. Remote could be a bit bigger (for better handling in the dark). I grew up with old, analog Sansui receiver and a pair of Pioneer AS303 DIY floorstanders (both around 35 yrs old), so it is a bit specific type of sound that I used to listen. I value depth, precision, dynamics and everything, but above all, I value the live-sounding system. When time has come to buy a new amp, I was sarching for similar sound, and that was not an easy thing to find. Tried many products in that price range (NAD, Rotel, Denon, Cambridge Audio, HK etc) and almost lost hope, really... So I consider this Yamaha as a saviour of my music-listening. RX-797 has a simple and functional design, looks great, and has great build quality, too. Display is large and clean (orange is absolutely best for display color, it reads much better from the distance than blue or green), and all functions are easy to use. Also, there is plenty of inputs and outputs, everything you could need, I think. The sound is great: powerfull, precise and deep bass, rich mids, clear and balanced high frequencies. CD direct AMP is superb. FM tuner has strong and clean sound. In fact, this Yamaha is as they asked me what I expect from a stereo receiver in any possible way, and I believe that says it all. 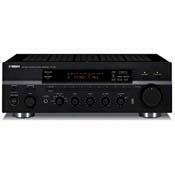 I bought this receiver, and hooked it up with a Yamaha equalizer EQ-70, with Yamaha NS-777 for the speakers. I was really amazed at the sound quality, the depth and richness of the sound. Exactly that I was searching for and its worth every penny...go for it. Phonograph ready!!! CD enhancement features! Speaker Cable wire connection a bit awkward. Bought the Yamaha RX-797 to replace my old dependable Yamaha R-100. Hooked up to my R-100 is a ADC stereo frequency EQUALIZER , model SS-315X. Since I record albums from vinyl to CD transfer, this set up has provided me with countless hours of enjoyment while listening through my Bose 301 speakers. As advertised, the RX-797 can be used to connect an equalizer by using the COUPLER jacks provided. I run the IN/PLAY jack of the SS-315X to the PRE OUT of the RX-797, and the OUT/REC of the equalizer to the MAIN IN jacks of the 797. To record the Lp, I find that it is necessary to connect the REC/IN jack of my PIONEER CD RECORDER to the LINE OUT of the EQUALIZER. I have tried several different connections and i cannot seem to get the RX-797 to produce the sound from out the speakers as I once did on my R-100 receiver. With my equalizer connected as described, I am able to record the Lp using my headphones connected to the PIONEER CD RECORDER PDR-609. ALSO, the equalization settings are able to be adjusted as needed to enhance the Lp sound. After recording the Lp, it is only a simple matter of replacing the COUPLER PINS and using the RX-797 as the default receiver to play the CD created. Of course, you will be using the CD inputs on the receiver to again use the Cd player. Nice Cd features are included on the RX-797, which IS a step better than the old R-100 !! !